One way to avoid purchasing expensive pre-made trellises and cages for your garden is to make your own from wood or bamboo, but those materials can also be quite costly these days. One alternative is to grow your own! Sunflowers are not just a great source of beauty for you garden, but they can also be recycled into some pretty nice lightweight stakes. For best results, I recommend planting the taller varieties of sunflowers. We have several different varieties of sunflowers growing throughout our property and most of our sunflower stakes are in the 5-7 foot range with some of them bearing a diameter of up to 2 inches. I like the idea, but how do I turn my sunflowers into garden stakes? Once the flowers have completed their bloom and the plants start to die, simply dig up the sunflowers, remove all the leaves, and then carefully saw off the root balls and let the stalks dry out a bit. The thicker stalks are obviously the strongest, but even some of the smaller stalks prove to be strong enough to help support lightweight vine-type plants in your garden. Keep in mind that sunflower stalks are not wood and they can be crushed or broken so it’s best to tie them to each other as often as possible in order to help distribute any weight that they will bear. Once my sunflower stakes are ready, how do I use them in the garden? Really, just be creative and use them anywhere that you can. One thing you can do is take 3 or more stakes that are of equal size and length and arrange them in a tepee formation, tying them together at the top with some hearty twine or wire. Add short pieces for horizontal support if needed. Once you have your sunflower tepee, place it over the top of a vine and train the plant to crawl up the new sunflower cage. Another idea is to drive a few sturdy metal or wooden stakes into the ground and then use your sunflower stakes horizontally and diagonally to build out a nice little trellis. 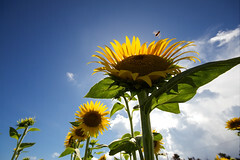 Don’t forget to tie the sunflower stakes together liberally in order to provide as much strength as possible. So why not save a few dollars and recycle your sunflower stalks all at the same time! Have you ever used sunflower stalks in your garden? Please leave a comment and let me know your ideas. This entry was posted in Gardening, Sustainable Living and tagged Gardening, Home and Garden, Sunflower, Sustainable Living by Todd Bryan. Bookmark the permalink.